WORLD No. 5 Bryson DeChambeau carded a second successive 66 to move into a share of the halfway lead at the Omega Dubai Desert Classic alongside rising Australian star Lucas Herbert. DeChambeau is chasing a first overseas victory as a professional but has form at the Emirates Golf Club, having won the amateur medal thanks to a tied 18th finish at the 2016 edition. And the Californian, who now lives in Texas, moved to the front on 12-under in Dubai courtesy of a roller-coaster six-under 66, which included one eagle, seven birdies and three bogeys. The winner of four PGA Tour events last year said: “I thought after yesterday, getting it around not making a bogey was awesome. 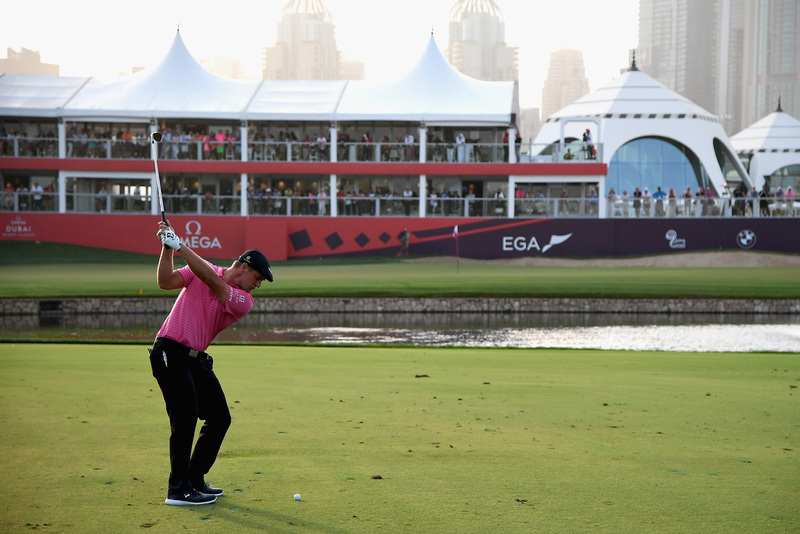 “But today was even more impressive with three bogeys on the card, still shooting six-under. “I was happy about that. Unfortunately, again, I just didn’t have the right sensations and proprioception over shots. “I just felt uncomfortable, unfortunately, on a lot of them, and consequently my ball-striking is just not my best. “But I’m not complaining one bit. There’s no complaining here for sure, so I’m happy. The player dubbed the “Mad Scientist” because of his meticulous use of degrees and angles in both his long and short game added: “I’m pleased I’m playing golf. “I’m getting it in the hole and executing the right shots when I need to and making a lot of key putts. “That was one of the things I talked about this week, was reading the green right, and we’ve done a pretty darned good job so far. “Hopefully we can keep it up,” said the 2015 NCAA champion, who spent four years at Dallas’ Southern Methodist University, and was crowned US Amateur Champion in the same season as he took the US College crown. DeChambeau was joined at the summit by 23-year-old Herbert, who equalled his career-best round of 63 – climbing 30 places up the leaderboard to move into contention for a maiden European Tour title. Three-time Omega Dubai Desert Classic winner and four-time Major Champion Ernie Els was joined by Alvaro Quiros – another past winner at the Emirates Course – in a share of third place on 11-under. Defending champion Li Haotong, qualifier Callum Shinkwin, Frenchman Matthieu Pavon, four-time European Tour winner Matt Wallace and Australian Jason Scrivener are tied in fith on 10-under. Quiros, whose last win came in a play-off in Sicily nearly two years ago, said: “It was nice, especially because my putting has been great today, even when I skip two or three short putts. “I’ve been working a lot with José María Olazábal and with my coach, José Rivero. It looks like it’s paying off. “Last week I was putting nicely too, so even with these grainy greens, it’s key. “Obviously I have to recognise that the golf course setup is a completely different thing every day. “Around the greens we don’t have any more heavy stuff as we used to have, and the wind intensity is what is going to change the direction of this course. “Either we are going to keep up or we are going to still be shooting very low scores to be at the top of the leaderboard. Wentworth’s Els, who is playing more again in Europe after moving to the States to look after his son who suffers from autism, said: “I like this place, as you know. “I’ve had some really great times here. I’m swinging well, my body feels well. “Just going on the memory bank, I guess. Playing with Colin (Montgomerie) and José (Maria Olazabal) was also fun. “We’ve done a lot in the game, and we had a good couple of chats, and I found my form. You’ve got to love it. “It’s obviously a little different to when I won here, the golf course. “They’ve really grown the rough. I see the scoring is really good. I see scoring slowing down a little bit over the weekend in the afternoons. © 2019 Golf North. All Rights Reserved.